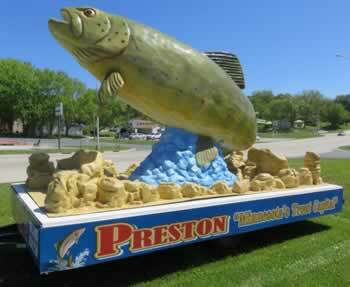 Preston is the Trout Capital of Minnesota! Preston has some of the finest trout streams in the state. The Root River has many species of fish including Brown, Rainbow and Brook Trout, Small Mouth Bass, Channel Catfish, Rock Bass, Sunfish, Crappies and Rough Fish. Visit the National Trout Center for information and maps. The Driftless Fly Fishing Company offers flies, gear and tackle, as well as guided fishing trips. There are plenty of hunting opportunities in and near Preston Minnesota. Wildlife in the area includes White Tail Deer, Wild Turkey, Pheasants, Partridge, Grouse, Gray Fox, Red Fox, Coyotes, Raccoon’s Woodchucks, Squirrels, Weasels, Badgers and rabbits. Visit The DNR website for more information.